An ex-prizefighter (Marlon Brando) and underling for a waterfront crime lord (Lee J. Cobb) witnesses a murder which he unknowingly helped stage and is instructed by his mob attorney brother (Rob Steiger), among others, to keep his mouth shut. However, after the interventions of a stubborn parish priest (Karl Malden) and the affections of a sweet college girl (Eva Marie Saint) and kin to the deceased, the underachieving Terry Malloy begins to have doubts and considers testifying for the Crime Commission. 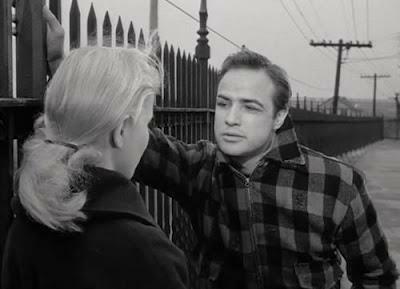 "On the Waterfront" is Elia Kazan's stark and gritty masterpiece which can also be seen as his defense for his 1952 testimony for the House Un-American Activities Committee which made him an outcast in Hollywood and left many people out of a job. The film features an intelligent and tough script from Budd Schulberg and Kazan successfully captures the local flavor of his subject. The acting is extraordinary, beginning with Brando in a career defining role that won him his first Oscar and assured his stature as an international film star. Saint is great in her introductory role that also garnished an Academy Award and Cobb, Steiger, and Malden are all powerfully intense in their own respective ways. "On the Waterfront" is an undeniable classic: an uncompromising look at an underworld life, lost opportunities, and ultimately, redemption.